I’ve been so busy lately I’ve hardly had time to cook anything! Or to write anything. Or to do anything but work. Oh, but wait…I’m retired aren’t I? Sure am, yet it seems I’m busier than ever these days. Since I retired, I’ve been enjoying letting my creative side run rampant. I’ve taken some watercolor classes and spend lots of time practicing at my painting table by the window with beautiful north light. And now, I’ve begun making handmade books – journals, photo albums, sketchbooks. I’m enjoying the book binding just as much as painting. By the way, I’m going to be showing and selling my paintings and hand bound books for the first time in October in my home town of Colquitt, Georgia. The chamber of commerce is holding their 2nd annual Bless Your Art Southern Folk Life Festival on October 28. If you’re anywhere near there, come out to see me. The recipe I’m sharing today is an oldie. From the 70’s as best I remember. Mississippi Mud Cake is basically a brownie base with melted marshmallows on top and a chocolate frosting drizzled all over the top. Oh, brother. What could be wrong with that? Add the sugar, butter, cocoa, eggs, vanilla, and salt to a large mixing bowl. Whisk it all together until combined. Stir in the flour and 1 1/2 cups of the toasted pecans. Pour the batter into a greased and floured 15×10-inch pan. (Tip: for any chocolate cake, if you want to make sure the finished cake doesn’t have white flour on the outside, use cocoa to dust your pan) Bake for 20-25 minutes or until a tester inserted in the center comes out clean. 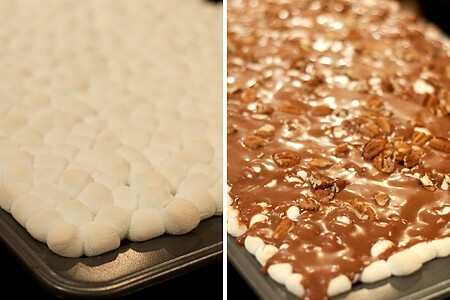 Remove the cake from the oven and top it evenly with the marshmallows. Return to the oven and bake for 5 more minutes. While the cake is baking, make the frosting. Easy as can be – just place all the ingredients in a medium bowl and beat at medium speed with an electric mixer until combined and smooth. Remove the cake from the oven and drizzle chocolate frosting over the top. The marshmallows should have a very lightly toasted look. Sprinkle with the remaining toasted pecans. It’s really important to allow the cake to cool completely before cutting it. If you let it cool completely, even refrigerate it, before cutting it will look so much nicer. A rich, delicious chocolate cake layer topped with marshmallows and chocolate frosting. Add the sugar, butter, cocoa, eggs, vanilla, and salt to a large mixing bowl. Whisk together until well combined. Stir in the flour and chopped pecans. Pour the batter into a greased and floured 15x10-inch pan. Bake for 20-25 minutes or until a tester inserted in the center comes out clean. 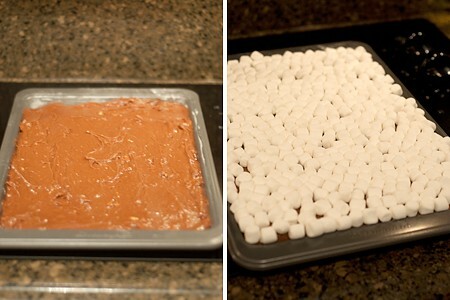 Remove the cake from oven and top evenly with the marshmallows. Return to the oven and bake for 5 more minutes. While the cake is baking, make the frosting. Place all ingredients in a medium bowl. 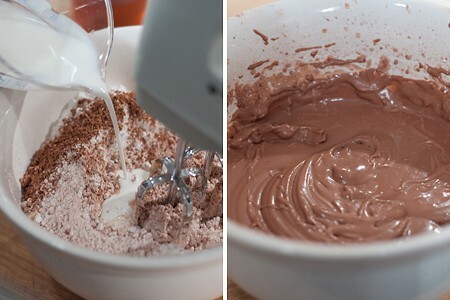 Beat at medium speed with an electric mixer until combined and smooth. Remove cake from the oven and drizzle chocolate frosting over warm cake. 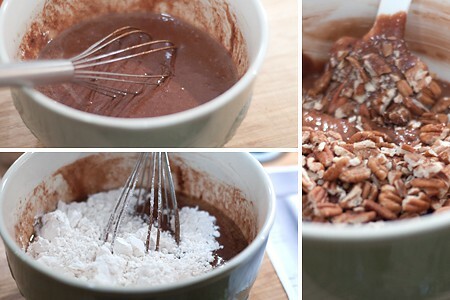 For a shortcut, you can substitute two packages of brownie mix for the cake layer. This looks sinfully delicious. Wish I had some right now. 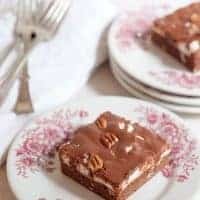 I have never put roasted nuts in brownies, but it sounds like it would give it a real boost of flavor. Will try this the next batch I make. It’s so good! 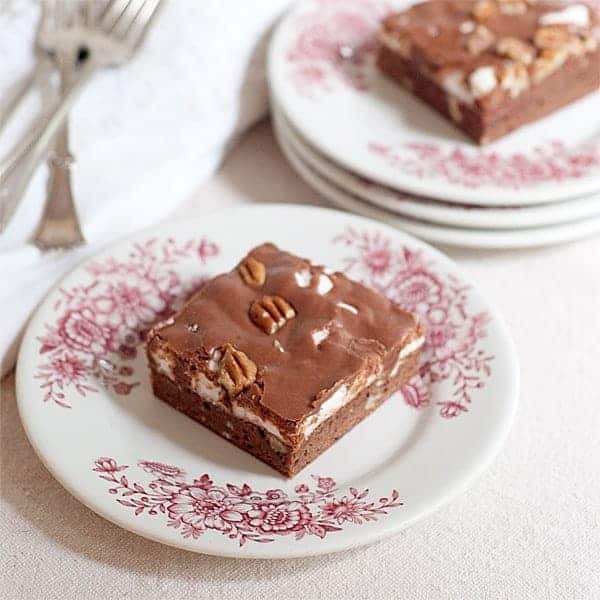 All that chocolate and marshmallow…yum! And yes, the toasted pecans make a big difference. I think you’d like them. Thanks Sues. It does help to have something to look forward to after a lovely long weekend, doesn’t it? I received a Mississippi Mud Cake from a friend from that state back in the sixties. And of course I had to get her recipe. And hers is better, in my opinion, than yours. Mainly because it calls for a cooked fudge frosting, not the usual confectioners sugar one. So, you bake the cake, with pecans in it or on top. Then you put on regular size marshmallows and cover that immediately with the hot– just off the stove–fudge. That melts the mms. Try that, and you will never go back to your recipe! 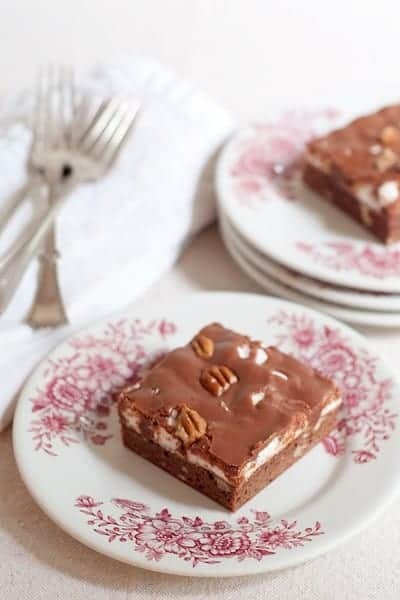 I would love to make a Mississippi Mud Cake – I have never baked one and according to your directions it does seem tasty – would you mind sharing it with me. I can not tell you how many times I’ve made this over the years but now I realize it’s been a while; it was a mainstay of get togethers with family and friends for many years. Totally decadent and totally divine too! I need to do this again! I can’t think of an occasion where I wouldn’t welcome this cake, Barb! Decadent, yes. And what a treat! I got this recipe from a friend, who was from Mississippi, incidentally. The only difference from your recipe was the one for the chocolate frosting. My recipe calls for a cooked, fudge like frosting that I just love. Perfect pudding for a family get together. I didn’t have enough icing (powdered) sugar to make the amount given but I made up for it by finely chopping some dark chocolate and sprinkling it over the top with the pecans. Oh my….. looks like “joy on a plate!” I just wish it was my plate. Make yourself one! It’s such an easy recipe.